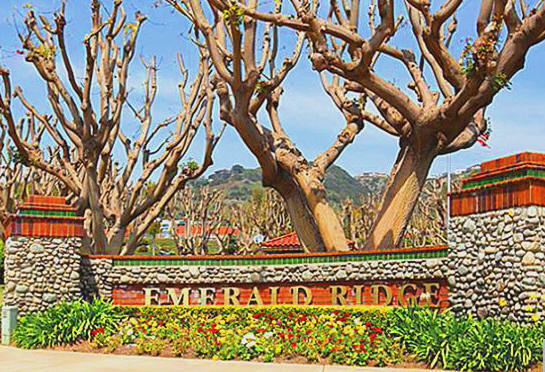 Emerald Ridge is a beautiful, 24 hour guard gated neighborhood in a desirable location across from Pacific Coast Highway and close to the border with Laguna Beach. The Emerald Ridge homes are custom, and their main characteristics are the large lots and the beautiful unobstructed ocean and Catalina Island views that can be seen from most of the homes. Search all Emerald Ridge Homes currently available for sale in the MLS, including short sales and foreclosures. For mmore information about any of the homes listed below, please contact us at (949) 888-6788 or via email. Read more about the Emerald Ridge real estate options including rentals. Since all the homes in Emerald Ridge are custom, the real estate options are endless. Emerald Ridge has a close location to Laguna Beach, many get even confused thinking the neighborhood is part of South Laguna. The neighborhood has about 76 custom homes, that have anywhere from two to five bedrooms, single or two story designs, two to three car garages and about 2400 to almost 4000 sq ft in size.Streets for this neighborhood include: Via Mentone, Via Antibes, Barcelona, Via Cordova, Via Genoa and Via Orvieto. OCExecutives specializes in real estate transactions of Emerald Ridge Homes in Dana Point, California. Contact us today to sell real estate or buy real estate in the Emerald Ridge community of Dana Point or for more information about any of these Emerald Ridge homes. If you would like to see a list of homes in other communities in Monarch Beach or Dana Point, follow the links above, or click here for other Dana Point Real Estate.